Imagine a fire crackling and smoke rising from a fire tended down the central corridor of a longhouse, as you step out of the cold and into the warmth of your home. Your family is sitting all around the fire chatting, working, cooking, and enjoying each others company. Archaeologists try to make meaning of archaeological traces to understand different moments in time. 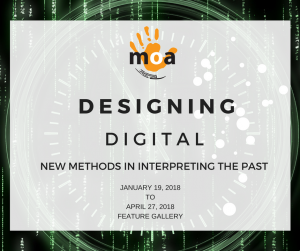 Explore visual representations of these moments in time, from early dioramas to using virtual archaeology, and learn how these new technologies are shaping our understanding of the past. Long before Canada and long before London, a thriving and vibrant village settled at this location. The inhabitants were busy throughout the year collecting the plants of each season and preparing for the winter, when fresh food was scarce. Agricultural plants were labour intensive, but provided a reliable food source for year-round consumption and the harvest time of year that was one of the busiest. The air around the village would have been thick with the smell of wood smoke and roasted food and the sound of busy voices, ceremonial songs, reunited laughter, barking dogs and chopping wood. As you celebrate the harvest this season, remember that these foods and this season have been celebrated since a time immemorial. 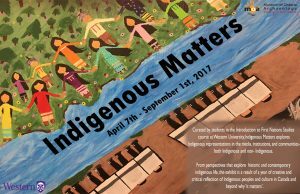 The students explored Indigenous representations in both Indigenous and non- Indigenous media, institutions and communities, examining historic and contemporary Indigenous life. Among the items created by the students are photos, sculpture, fabric arts, paintings, leather work and carvings. Co-curated by Claude Bock and Nicole Aszalos? 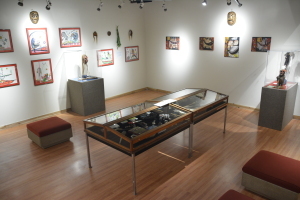 Selections from the Collection: History, Culture, Legends?exhibits contemporary First Nations art from the Museum of Ontario Archaeology’s growing contemporary art collection using work created by Indigenous artists from across Ontario. The artists featured in this exhibition combine history, culture, and legends along with present day realities. Similarly, the collection of Mohawk pottery is a melding of traditional patterns and symbology with contemporary interpretations. Through presenting these artworks, the Museum of Ontario Archaeology aims to encourage visitors to learn more about the artworks, artists, and traditions. Selections from the Collection?is the result of a recent archiving project conducted by Claude Bock for his MA in Art History at Western University. Decolonizing Frames?charts the creative journeys of students as they studied topics ranging from the history of colonialism in Canada, Indigenous Knowledge systems, residential schools, food sovereignty, representation, and self-determination. 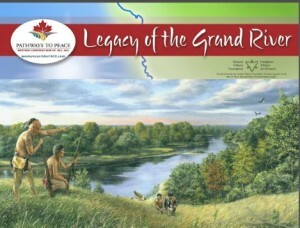 Some expressions reflect the personal journeys of the students themselves, while others reflect on the deeper histories of treaty relationships in the lower Great Lakes, while others explore family lineages, Indigenous landscape modification, and gender. 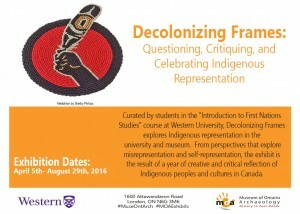 Ultimately, Decolonizing Frames?is about questioning, critiquing, and celebrating Indigenous representation. 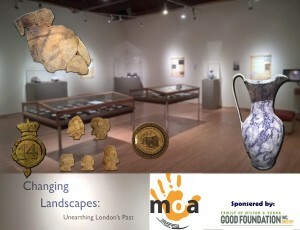 Curated by?Nicole Aszalos,?Museum of Ontario Archaeology, with Rob Pihl, ASI; supported by the Good Foundation. Take a journey exploring London’s earliest settlements to see how these sites have evolved and are being used in our community today. Did you know?that?there are hundreds of archaeological sites throughout the city of London, Ontario? Some of these sites might even be part of your neighborhood! The early history of London includes aboriginal, pioneer, and early military sites. ?With new development and reuse of our landscape, London’s history can be studied through excavated archaeological sites, archived stories, maps, and photographs. Changing Landscapes?explores?four areas of our city where archaeological sites have been investigated: Victoria Park, Springbank Park, Jackson District, and?Kensall Park. 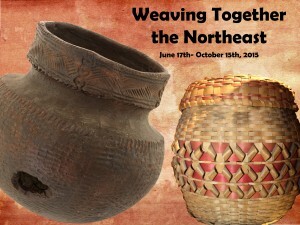 Weaving Together the Northeast is a special exhibit curated by the students of Professor Thomas Peace from Huron University College at Western University in partnership with the Museum of Ontario Archaeology. 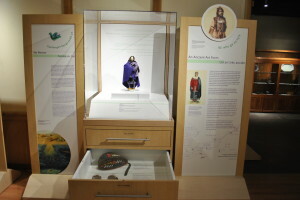 The exhibit concentrates on the history of northeastern North America between the 16th and 17th centuries, and how the First Nations people in Southwestern Ontario connected with the broader context of Canada. Discover this collaborative exhibition interwoven into the permanent exhibitions in the main gallery space. 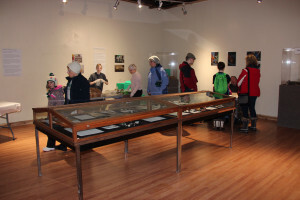 Students had the ability to bring their research into a feature museum exhibit by using artifacts from MOA’s collection to illustrate their work. 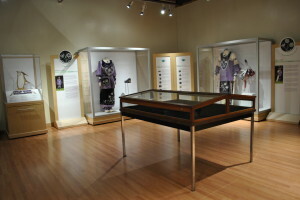 Incorporated in this exhibit is a section of First Nations beadwork, including pre-European contact beads and Wampum beads. ?This section of the exhibit is the work of the students from Historian’s Craft from Huron University College.Weaving Together the Northeast?highlights the relationship between the First Nations and the European settlers and the complex interconnectedness of the various First Nations societies by understanding the importance of First Nations?history and this time period. For the Onkwehon:we the concept of art is not defined. Creative endeavours were a part of life, and those who created shared their gifts for the pleasure of all. 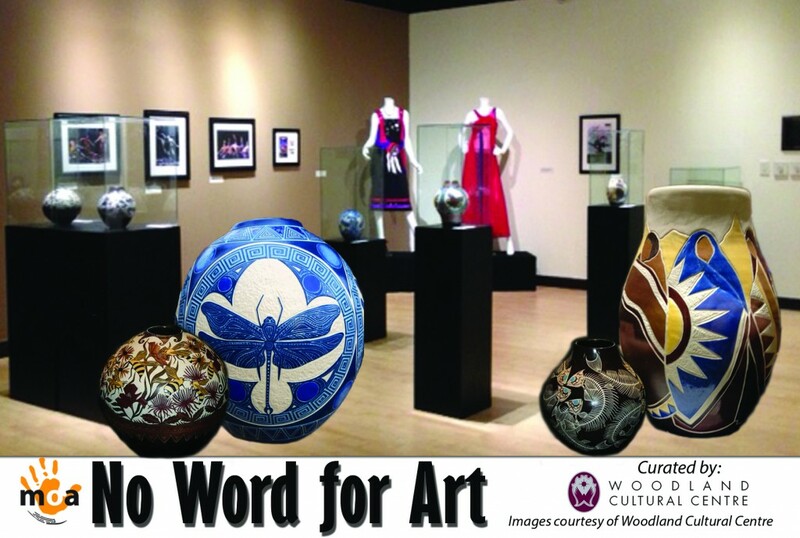 No Word for Art is an exhibition highlighting the artistic achievements of Santee Smith, an accomplished dancer, choreographer, performer and pottery designer, and one of Six Nations’ finest creative artists. Santee Tekaronhiáhkhwa Smith is a mother and multi disciplined artist from the Kenien’kehá:ka (Mohawk) Nation Turtle Clan of Six Nations, Ontario. In 2005, she founded the internationally acclaimed Kaha:wi Dance Theatre based on her first major choreography work of the same name. Since then, her artistic endeavours have grown and have granted her numerous nominations and awards, including a Canadian Aboriginal Music Award and a Dora Mavor Moore for Outstanding Choreography. As an artist, Santee commits to sharing Indigenous stories that speak about identity, humanity, and relationship to the natural world. She often teaches and speaks on contemporary dance, performance, and First Nations arts and culture around Canada and the United States. Learn about the significant communication methods of wampum belts, trade goods,?and trail marker trees during the war. 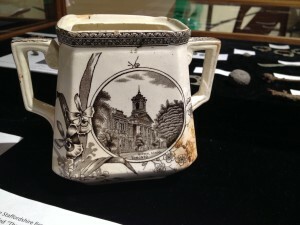 Explore art and artifacts depicting life during the War of 1812 from the Chippewa experience. 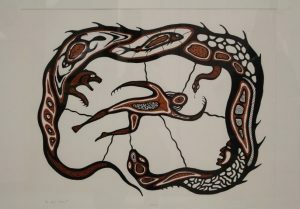 Ken Rollinson is a Métis Artist with Abenaki/Mic mac and European ancestry.? His show will feature carvings, illustrations and photographs documenting his research into the use of plants in aboriginal traditional medicine, through the use of meditational prayer and heritage tobacco.? The imagery documents his spiritual connection and communication with the plants he works with as was done in the past.? The hope is to help people to understand the belief that all things are connected through spirit and when that is respected the result is the sharing of information that enables survival for all. 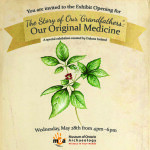 The Story of Our “Grandfathers” featured?Indigenous plants and medicines. Visitors explored?the interconnections of plants, food, medicines, and spirituality by journeying through the First Nation story of the origin of plants and foods. ?The exhibit featured many different indigenous plants to the Great Lakes region, how they were collected, their medicinal and practical uses. View our Press Release?for further background information. Watch this?video on the Haudenosaunee creation story which accompanies the exhibit. When excavating in the field gets too cold and frozen to dig, what do Canadian?archaeologists do? They move into the?lab and work on artifact conservation, site reports, cataloguing, and more! 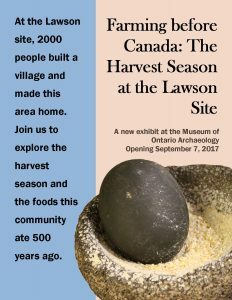 ?This exhibit also featured selected artifacts from the?recent excavation?at the Fugitive Slave Chapel site at 275 Thames Street. This button originates from the postal service in France. It’s a mystery how it ended up at the FSC site in London, Ontario. 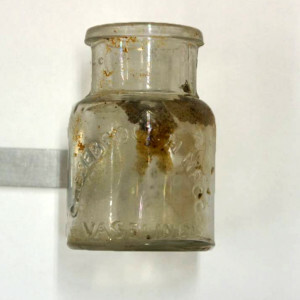 This Wallis Grimson & Co 1884 ceramic piece was one of few items found fully intact at the FSC site. Bead workers have played a vital role in preserving Iroquois beliefs over the centuries. 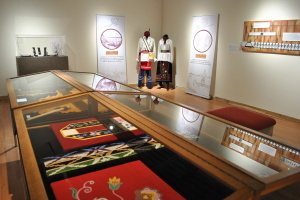 This exhibit, from selections of the?ROM collection and?Iroquois beadwork artist Samuel Thomas, revealed the meaning expressed in Iroquois beadwork and culture which still thrives today. The Feature Gallery was buzzing this summer with Western University work study students and volunteers working on the Museum’s artifact re-boxing project. ?Our?assistants?prepared the Museum’s collections for transfer to the Sustainable Archaeology facility by removing any non-archival materials, such as cardboard and paper bags, and transferring them into inert and acid free archival materials.